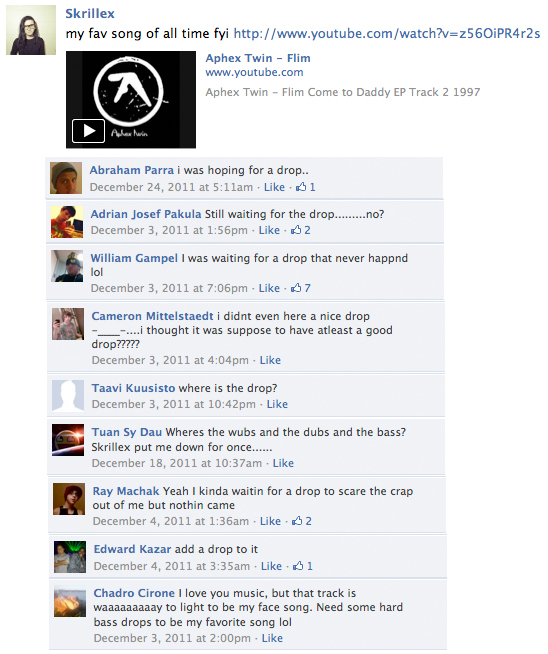 Skrillex just teasing > these poor kids. We've grown so accustomed to the updates, tweets, videos, SoundCloud tracks and other musical posts to hit us with some insane wobbly bass or some form of a dubsteppity golden section that we get disappointed when Skrillex doesn't provide us with a nasty drop. No wub wub? Wah wah. This entry was posted in rando and tagged bass, drop, dubstep, facebook, skrillex, soundcloud, twitter, wobble, youtube. Bookmark the permalink.